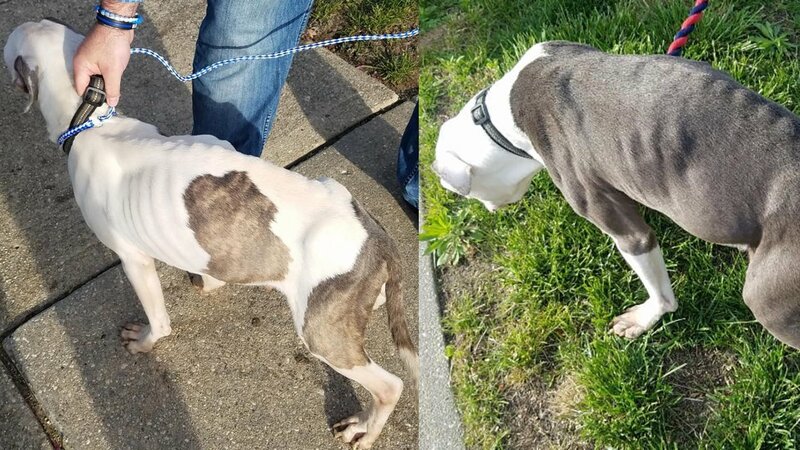 MASSAPEQUA, Long Island (WABC) -- Police arrested two men after their dogs were found very thin and malnourished. Thomas Skuza and Thomas Skuza Jr. of Massapequa, were arrested, accused of failure to provide proper sustenance, officials said. The Nassau County SPCA detectives said Tuesday that the men deprived their two dogs, Romeo and Damian, of food and water. Detectives said the dogs were dehydrated, and emaciated with ribs, spine and hips showing. Romeo and Damian were taken to an animal hospital and will need extensive care. A veterinarian found both to be underweight, and Romeo had metallic items in his stomach, according to the SPCA. He will likely need surgery to remove them.